We love the idea of foraging for mushrooms, boots and hats on and off to the woods on a bright but chilly Sunday afternoon. We are certainly not pros, and still take someone in the know with us, so we don’t by mistake happily pick up a ‘Destroying Angel’ or a ‘death cap’. The plus with going hunting with an expert is that they always have their secret spots, mind you – you would be lucky to get that info, something that they are very reluctant become public knowledge (no joke we have family members who wont even tell us where their secret spots are!). The self satisfaction of getting home after foraging (normally a tiny amount in our case) and cooking it up for supper is next to none. Nothing beats a mixed mushroom bruschetta – we make ours in a frying pan over a medium heat with butter, shallots, garlic, tarragon, parsley and a swig of white wine, onto toasted sourdough with a poached egg on top. This mushroom pie is one of our absolute favourites for autumnal cosiness, nothing makes you happier than digging into this curled on the sofa with a good movie while hearing the leaves rustle in the dark outside. We have done individual ones, as feels fun to pull out of the oven your own little pie, put if making for a few probably easier to just make a large one. Just to make it easier we have done something naughty and used ready made pastry that you can buy at the supermarket, as easy as pastry is to make it feels like the hugest effort at the end of a long day, however if you can muster the energy then you will have a better result (Dorset pastry – store bought is quite good). 1. Preheat oven to 180 degrees 2. Heat a pan over a medium heat and add the pancetta, if sticking add a dash of oil, cook till starting to go crispy. Then add the onion, garlic, chilli, fennel, sage, and rosemary and sauté for 5 – 10 minutes. 3. Add the shitake, enoki, porcini and continue to sauté for a further 5 minutes, then add the dash of sherry and let sizzle for a moment. Add the spinach till it wilts. 4. Add the double cream, gruyere, egg, mozzarella and season with salt and pepper, continue to cook for another couple of minutes. 5. Roll out the pastry on a floured surface. Turn one of the dishes upside down and cut around the edge, creating the lids for the pies. 6. 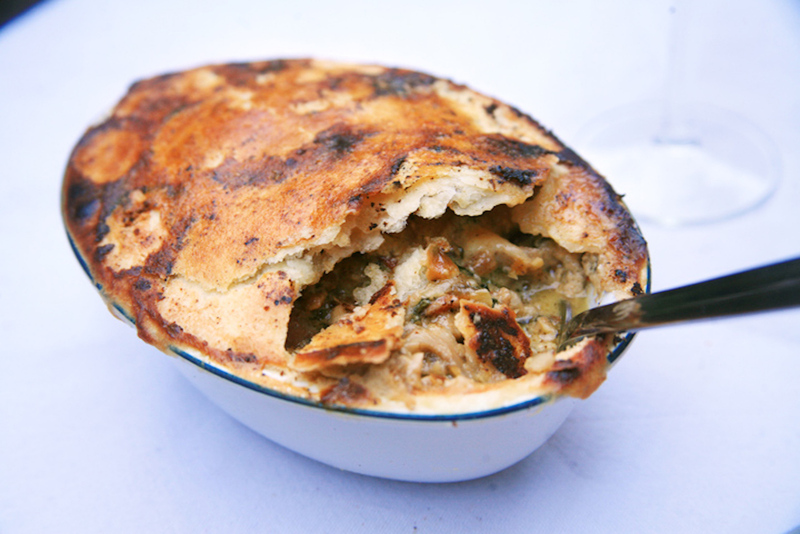 Spoon the mushroom mixture into the pie dishes, then lay the pastry on top, pressing down the sides. Stab the middle with a small knife to let the steam out when cooking, then brush with the beaten egg (for a nice glaze). Cook in the oven for 20 mins, until golden brown.